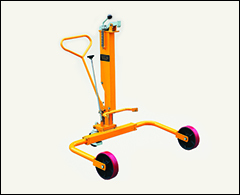 Drum cradle, drum dolly, drum truck, drum handler, drum lifter, hand trucks. Additional drum equipment is available on our Drum and pail heaters , Drum deheaders, funnels , Drum pumps , Faucets , and Faucets for flammables pages. Convenient way to tip, drain, and store 55 gallon drums. The 2.5" polyolefin wheels are on outside of frame. Single self-storing load tipping lever. Easy for one person to use. 32" long by 19" wide, 32 lbs. Ships knocked down and boxed. Capacity is 600 lbs. Drum distance to the floor is 15". 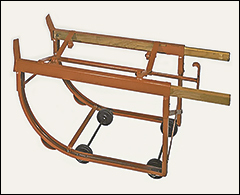 Cradles are also available with dual telescoping wood handles and larger 4" wheels, or models like this one, with 2 swivel casters, or wheels on the inside of frame. Tip, drain, rotate, store, and move 30 or 55 gallon steel and fiber drums. Dual telescoping wood handles allow easy two handed control, and provide good gripping surface for cold weather useage. Large 4" x 1 1/4" polyolefin wheels for easy transportation over seams and expansion joints in floors. Ships knocked down and boxed via UPS. Capacity 1,000 lbs, weight 50 lbs, 20" drain height, 25.5" overall height, 19" wide. All welded steel frame construction with reinforced outriggers. A superior design places drum chime over caster kingpin for greater load stability and long caster life. Four bolt-on hard rubber 3" swivel casters. Capacity 900 lbs. Weighs 19 lbs. Also available for 30 and 85 gal drums, and with iron casters. Heavy-duty 1" structural pipe frame, double welded joints, classic single bar frame design, vinyl handle grips 24" apart, and a kickstand. Machined steel load wheels behind nose prongs help ease the lifting of the drum. Handles 55 gallon steel drums. 1,000 lbs. capacity. 10" moldon rubber wheels. Weighs 64 lbs. Stores standing upright. Also available with polyolefin wheels. And dual pipe frame economy drum trucks are also available. 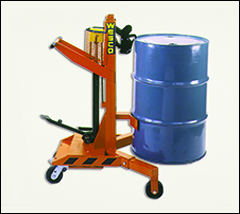 Ergonomic solution to lift, transport, and place drums on spill pallets. Auto grip lock automatically locks grip jaws closed. No need for operator to touch drum to raise, transport, or lower. Spring loaded clamp holds any rimmed drum. 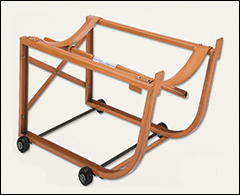 Hydraulic jack easily lifts steel, poly, and fiber drums 20" above floor. 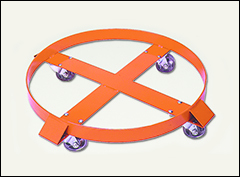 5" x 2" phenolic swivel casters allow easy movement and steering. Floor lock. 1,100 lbs capacity with legs extended 37". 650 lbs capacity with legs retracted to 34.5". Weighs 355 lbs. 48" high. Handles most 30, 55, and 85 gal drums. Economical method to lift and transport steel drums up to 22.5" in diameter. 2 rigid and 1 swivel locking caster for easy maneuverability. 8" front and 5" rear moldon polyurethane casters. Straddles pallets up to 33" wide. Lifting capacity is 550 lbs, and the lift range is 13.5". Drum size 55 gallons. Weight 99 lbs. Easy to use design: pulling top lever secures drum. 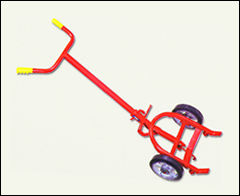 Pallet truck-type pump handle takes the effort out of lifting the drum. Easily lift the drum and dispense contents. Handles 55 gallon steel drums. Locks in a horizontal or a vertical position. Ships assembled and boxed. Full drum capacity is 800 lbs, half drum capacity is 500 lbs. Lifter weighs 45 lbs. Additional lifters available with a geared design with chain for controlled dumping from many angles and heights. 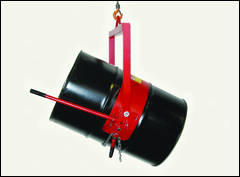 Hoist mount lifters also available.